Heat oil at medium heat on a non-stick skillet. Place fig quarters on skillet, sprinkle very lightly with salt, and cook until all sides with seeds are golden-brown. Set aside. Combine walnut halves and brown sugar at low heat, then bring heat up to medium-high. As brown sugar melts, use wooden spoon to move nuts around, ensuring all nuts are coated and the sugar does not burn. Cook for 5 minutes at most, then remove to a parchment-lined baking pan and quickly spread nuts out to prevent them from drying in clumps. Allow to cool for a few minutes. 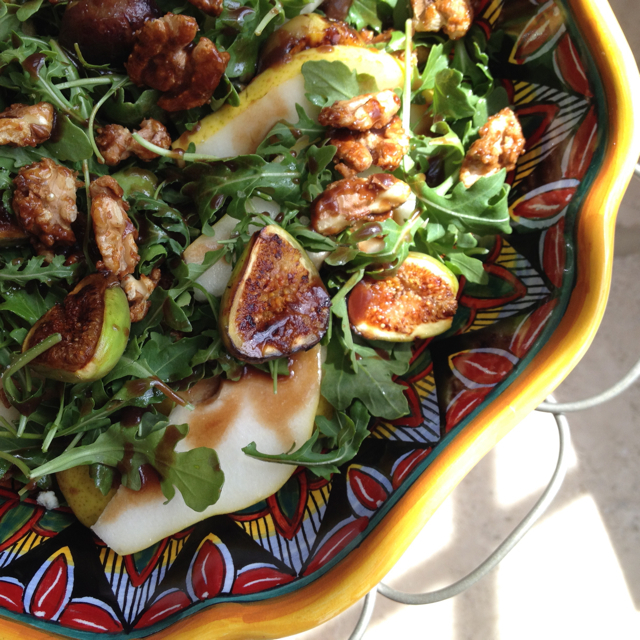 Toss together the arugula, pears, figs, walnuts, and a handful of crumbled gorgonzola. Mix together the salad dressing ingredients in a small bowl. Drizzle dressing on top of salad. Serve immediately.